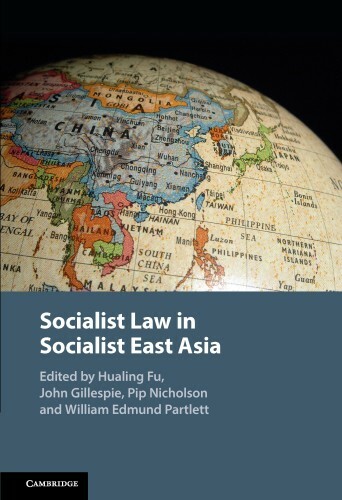 Join us to launch Socialist Law in Socialist East Asia, edited by Hualing Fu, John Gillespie, Pip Nicholson and William Partlett. Since China's reform and opening up started in 1978 and Vietnam's Doi Moi reforms were initiated in 1986, these two East Asian economies have adopted capitalistic models of development while retaining and reforming their socialist legal systems along the way. Tracking the trajectory of socialist laws and their legacy, this book offers a unique comparison of laws and institutional designs in China and Vietnam. Leading scholars from China, Vietnam, Australia and the United States analyse the history, development and impact of socialist law reforms in these two continuing socialist states. Readers are offered a varied insight into the complex quality and unique features of socialist law and why it should be taken seriously. This is a fresh theoretical approach to, and internal critique of, socialist laws which demonstrates how socialist law in China and Vietnam may shape the future of global legal development among developing countries. Join us for a panel discussion exploring different dimensions of socialist law. Drawing on their own contributions to the book, the panelists will discuss the historical origins of socialist law as well its ongoing development. The panel will be moderated by Associate Professor William Partlett. There will be an opportunity for brief Q&A as well. Professor Pip Nicholson will launch the book at the end of the discussion. The book launch, co-hosted by the Centre for Comparative Constitutional Studies and the Asian Law Centre, will start at 5:30pm with drinks and networking which will be followed by the panel discussion and the launch from 6:00pm – 7:00pm. Registrations are essential, so please register early to avoid missing out this fascinating event.